While there are many ways to create a do-it-yourself menu for your wedding, it is not always practical. 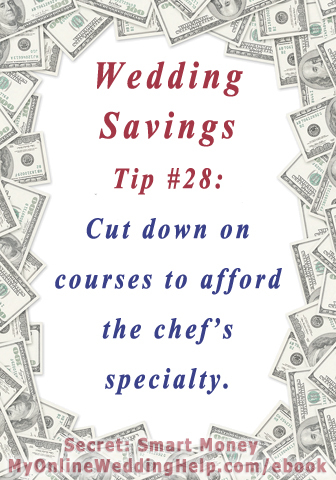 Plus, the traditional approach to wedding food can be much less stressful. Fortunately, you can save when going the full-service route as well. Typically, you meet with the venue’s in-house chef or an outside caterer, go over the menu options she offers, perhaps have a tasting, and make your selections. Except for providing headcounts and paying on time, it’s pretty much hands off from there. Have an hors d’oeuvres-only reception and serve the specialties in bite-size pieces (Caveat: guests should expect only a cocktail hour and it should be between typical meal times). Offer soup or salad, not both, during the meal. Go straight to the main course, without preamble. This post is based on an excerpt from the Dream Wedding on a Dime; 7 Secrets for the Budget-Savvy Bride ebook by Bobette Kyle. Go to MyOnlineWeddingHelp.com/ebook for more information.